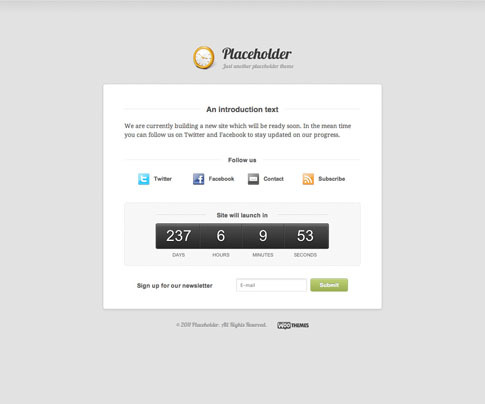 Placeholder is a free WordPress theme that is the perfect solution for those of you who have a website in development. The Placeholder theme simply allows you to let your visitors know how to get in touch with you and how long it will be until the site is finally launched. It is the perfect solution to add an extra layer of professionalism to your development so that nobody has to see all of the messy bugs you’re sure to be working out over the next couple of weeks! Functional landing page — A countdown timer to let your visitors know when your website will be live, social buttons, and a simple e-mail op-in form to allow users to follow your progress. Custom typography — You can customize basic typography in the theme, and there is full support for Google Fonts in the font selector. Alternative styles — Placeholder theme includes 5 alternative color styles, which you can preview in the demo, and also has styling options for background color and image in the options panel! Come back and check out the showcase as we find more sites from around the web using Placeholder.